In addition to a full-service spa, Hyatt Regency Phuket Resort features an outdoor pool and a fitness centre. Dining is available at one of the resort's 2 restaurants. Guests can unwind with a drink at one of the resort's bars, which include A poolside bar and A bar/lounge. Public areas are equipped with complimentary wireless Internet access. 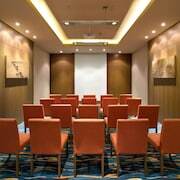 Event facilities measuring 2325 square feet (216 square metres) include conference rooms. This luxury resort also offers a kid's pool, spa services and a free kid's club. For a surcharge, a round-trip airport shuttle (available 24 hours) is offered to guests. Complimentary self-parking is available on-site. 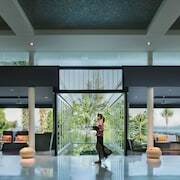 Hyatt Regency Phuket Resort is a smoke-free property. This family-friendly Kamala resort is located near the beach, within 2 mi (3 km) of Kamala Beach and Tsunami Memorial. Phuket Fantasea is 2 mi (3.2 km) away. Along with 2 restaurants, this smoke-free resort has a full-service spa and an outdoor pool. Free WiFi in public areas and free self parking are also provided. Additionally, a fitness centre, a bar/lounge and a poolside bar are on-site. All 201 rooms boast deep soaking bathtubs and tablet computers, plus complimentary wireless Internet access and LCD TVs with satellite channels. Other amenities available to guests include balconies, 24-hour room service and fridges. Hyatt Regency Phuket Resort offers 201 forms of air-conditioned accommodation with tablet computers and minibars. Rooms open to balconies. 40-inch LCD televisions come with premium satellite channels. Guests can make use of the in-room fridges and coffee/tea makers. Bathrooms include a separate bath and shower with a deep soaking bath and a rainfall showerhead. Bathrooms are also outfitted with a complimentary bathrobe, complimentary slippers and designer toiletries. Guests can surf the web using complimentary wireless Internet access. Business-friendly amenities include desks, safes and telephones. Additionally, rooms include complimentary bottles of water and a hairdryer. Housekeeping is provided on a daily basis. The Pool House – This poolside restaurant specialises in international cuisine and serves breakfast, lunch and dinner. A children's menu is available. Reservations are required. Open daily. 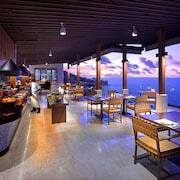 Sunset Grill – Overlooking the ocean, this restaurant specialises in international cuisine and only serves dinner. Reservations are required. Open daily. The Pool Bar – This bar is located by the pool. Open daily. Nahm Spa has 6 treatment rooms, including rooms for couples. Services include Thai massages, facials, body scrubs and body treatments. A variety of treatment therapies are provided, including aromatherapy. Rollaway/extra beds are available for THB 1484.00 per night.